Entire village in India relocates so Nature can move in. Up until recently, the village of Ramdegi was a bustling farming community in central India’s Tadoba-Andhari Tiger Reserve. Today, the village’s human population stands at exactly zero, though its streets and fields are now teeming with a different kind of life. As part of an ongoing effort to reduce human conflict with wildlife, the Indian government has been encouraging communities living in and around nature reserves to relocate for the sake of peaceful coexistence — and last month, everyone in Ramdegi did just that. Around 200 families agreed to accept incentive packages to move beyond the reserve’s borders, freeing the land to be reclaimed by the surrounding biodiversity. It didn’t take long before the village, now completely void of people, to be filled anew. A little over four weeks after the last human departed, Ramdegi is now home to herds of bisons, deer, antelope, and boars — grazing on the budding meadows that were once cropland and cattle farms. Predators too, once reviled by villagers for killing their livestock, are returning to Ramdegi. According to the Times of India, even a tiger has been spotted prowling the grounds of the empty village, free from dangerous and often deadly conflicts with humans that have driven the species to ‘endangered’ status. This is not the first time an entire village has moved out so nature could move in. 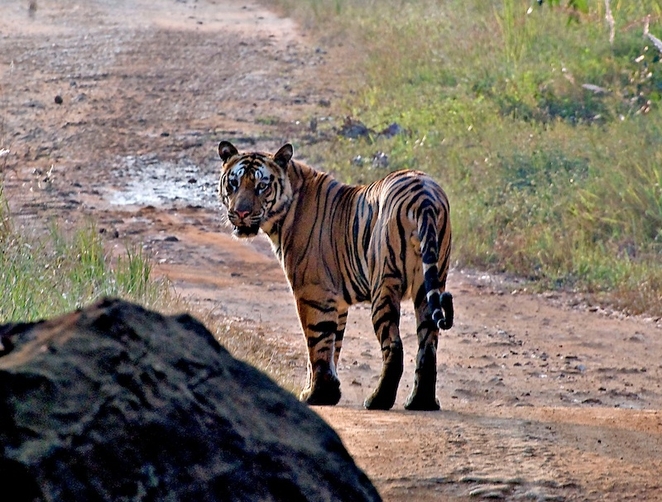 Across India, nearly a hundred communities have already voluntarily relocated to widen tiger reserves, and dozens more are expected to follow suit in the years to come.